Years before I became persona non grata in the Sierra Club for my criticism of its leadership’s refusal to acknowledge immigration’s environmental impacts and my participation in the intra-club insurgency known as SUSPS (Sierrans for U.S. Population Stabilization), I actually wrote a feature story for Sierra / the Sierra Club Bulletin, that organization’s flagship publication. The July/August 1981 issue of Sierra carried my article, “British Columbia: Canada’s Battleground on the Pacific,” in which I mourned the fact that the pristine forests, rivers and mountains of Canada’s spectacularly beautiful westernmost province were rapidly being converted into wood chips, pulp and paper, hydroelectric kilowatts, mine tailings and gaping pits. Into eyesores and effluent, in other words. Where nameless men by nameless rivers wander, and in strange valleys die strange deaths alone. …in the Northwest, there are no more nameless rivers, and most of the remaining strange valleys will soon be logged, dammed, mined or opened to rugged individualists in jeeps and campers. Since that article was published almost 35 years ago, the world’s population has swollen by an additional 3 billion and America’s by about 100 million. British Columbia’s population is more than 50 percent larger. And the beleaguered solitude and space I bemoaned have become ever-more menaced by the relentless tide of humanity and our long shadow. By our growing resource demands. By our far-reaching and intrusive noise. By our ubiquitous impacts on the Earth-enveloping atmosphere and climate. And last but not least, by the maddening crowds and traffic jams in our most beautiful, awe-inspiring natural areas, such as national parks. Jet contrails streak across the sky. sunlight reaching the lower atmosphere and Earth’s surface. 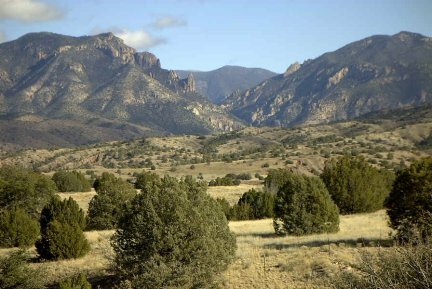 I have experienced firsthand the disruptive manmade noise and obnoxious crowding in some of America’s wildest and grandest places, including the very first wilderness area ever formally established in the United States, the Gila Wilderness in southwestern New Mexico. Aldo Leopold himself, then working for the U.S. Forest Service, pushed for the Gila. It was set aside (legally protected) in 1924, a full four decades before the Wilderness Act passed Congress and was signed into law by President Johnson in 1964. Backpacking through the Gila in 1989, I was appalled at the constant din of jet traffic overhead, and blue skies marred by persistent jet contrails. It may have been wilderness in name, but it wasn’t in reality any more. In Leopold’s day half a century earlier, the silence and the expansive blue sky would not have been slashed and sliced by a steady succession of commercial jetliners. Now, as soon as the noise from one jet passing overhead faded away, another began; they were almost perfectly synchronized to completely obliterate authentic silence, and a sense of majestic solitude, of being “away from” or beyond the grubby reach of industrial civilization. This artificial noise injected into the natural setting wasn’t loud enough to drown out bird song or the whispering wind, but it was loud enough to be noticeable – and jarring, because this was “wilderness,” empty, vacant, “untrammeled,” devoid of manmade objects, and one of the most thinly populated places left in the continental USA. Yet mechanized man’s pervasive presence was unavoidable and overbearing even here. In Leopold’s day, there still were wolves in this wilderness. Now, the howl of the wolf had been replaced with the incessant buzzing of jet traffic overhead. The price of progress? of a ceaseless procession of commercial jets passing overhead.